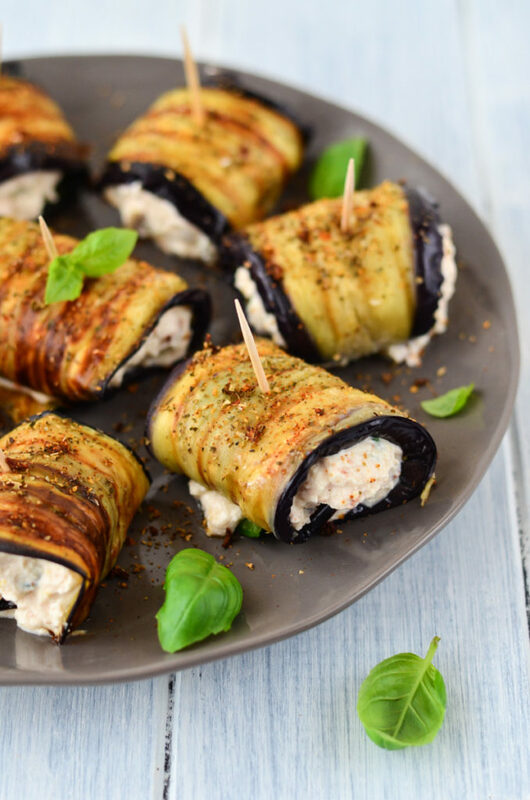 Grilled Aubergine and Courgette Rolls filled with a mixture of cheese, sun-dried tomatoes, lemon, and basil are ideal as a summer vegetarian appetizer. Courgette and Aubergine, used a lot especially in the Mediterranean cuisine, are my summer favorites. They are both delicious on the grill, brushed with just a few drops of olive oil, a pinch of salt and garlic. I have tried them in many variations but these ricotta rolls are awesome! 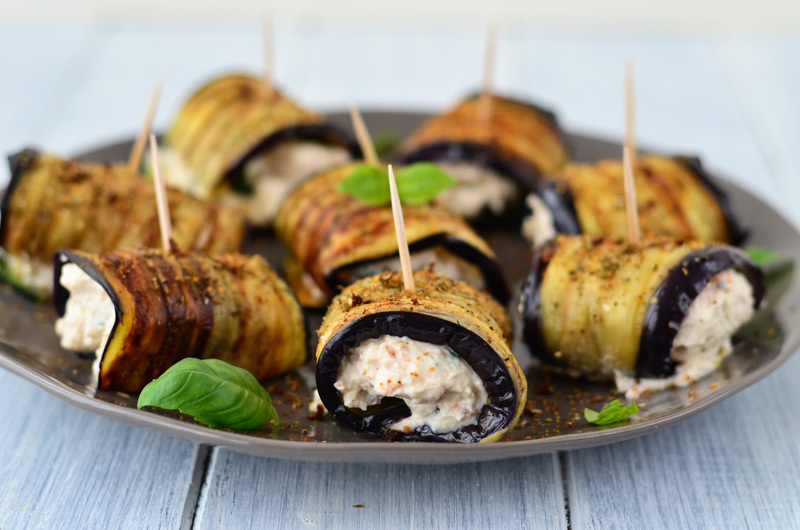 The preparations of these grilled aubergine and courgette rolls is not difficult and you can even grill the aubergine and courgette slices one day or few hours in advance, then store them in the fridge. With this recipe, you will have 8 pieces, but if needed, you can, of course, double the amounts. I used 1 large aubergine and courgette, but if you will not be able to find such pieces, then you can use 2 of each and cut the slices a little thicker (do not forget of course that you will need to roll them). For the lemon, I recommend you to use a non-treated lemon as you will need not only the lemon juice but also the lemon zest for the filling. 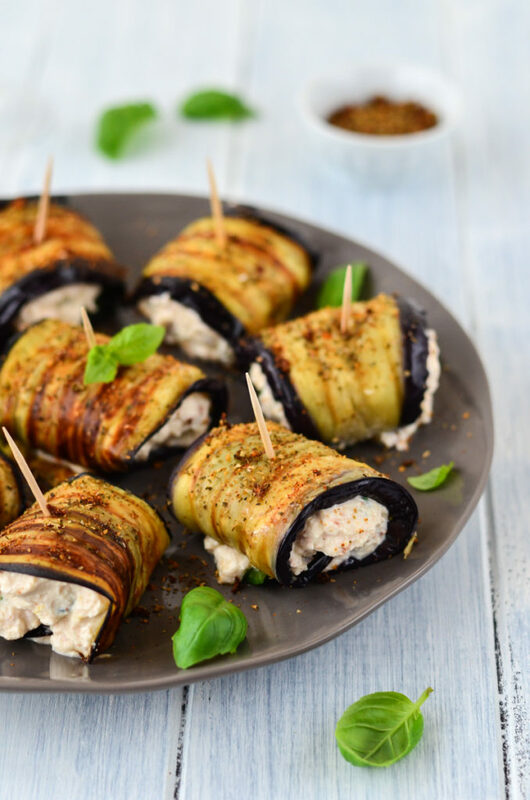 To prepare the grilled aubergine and courgette rolls with ricotta filling, you simply cut the vegetables lengthwise, brush with olive oil, a pinch of salt and garlic and grill from both sides. In the meantime, you mix together Ricotta, Parmesan, chopped sun-dried tomatoes, lemon zest and juice. After the cool down, you put the slice of courgette on the slice of aubergine, add some basil leaves and one spoon of the cheese filling, roll everything and skewer with a cocktail stick or toothpick. 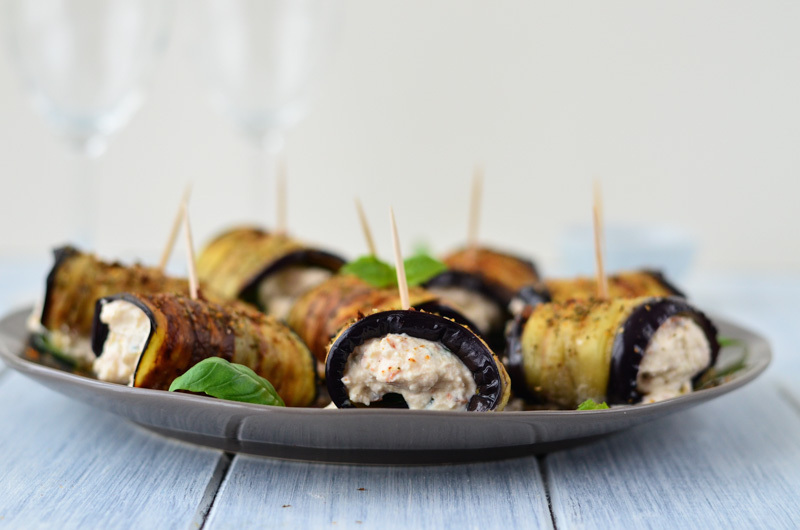 Grilled Aubergine and Courgette Rolls filled with a mixture of cheese, sundried tomatoes, lemon, and basil are ideal as a summer vegetarian appetizer. Clean the vegetables and cut each piece into thin slices lengthwise (2-3 mm). You should get 8 slices of aubergine and 8 slices of courgette. Mix the crushed garlic with olive oil and pinch of salt. Brush the slices of aubergine and courgette with the garlic oil and grill ethe slices for about 2-3 min from each side. Preheat the contact grill (or plancha grill) and grill the slices of aubergine and courgette from both sides for about 2-3 minutes. In the meantime, mix the Ricotta cheese with Parmesan, chopped dry tomatoes and season with salt and pepper. On a large cutting board, lay out the grilled slices of aubergine, top with the grilled slices of courgette and 2 basil leaves. Dot 1 tbsp. of the cheese filling on each, roll them up and skewer with a cocktail stick/toothpick. Serve arranged on a plate, sprinkled with paprika and the remaining basil.